It was always clear that Donald Trump could never be fully White House–trained. No chief of staff could ever quiet the billionaire’s bark, or keep him from chewing up the Oval Office scenery. The septuagenerian celebrity is set in his ways — and those ways include broadcasting nearly every destructive impulse that skims across the surface of his mind. But while few believed they could muzzle the president, many have thought he could be defanged. Which is to say: With the right personnel in place, Trump’s sound and fury could be made to signify nothing — or, at least, not very much. Here, Tillerson wasn’t merely disavowing Trump’s rhetoric, but rather, suggesting that the president’s most incendiary statements have no bearing on U.S. policy. This belittling of the president wasn’t unprecedented — only unprecedentedly public. Top administration officials have been reassuring the world that our commander-in-chief is “all bark, no bite,” for months now. After Trump vowed to meet the next threatening statement from North Korea with “fire and fury like the world has never seen,” White House aides and cabinet officials spread word that he was merely riffing. When the president abandoned a longtime U.S. ally over Twitter, Tillerson reaffirmed America’s support for Qatar. And after the president banned transgender Americans from serving in the armed forces (in a pair of tweets), the chairman of the Joint Chiefs of Staff ignored — and implicitly rebuked — his order. Earlier in the administration, Trump’s loud threats to cancel NAFTA, launch a trade war against China, withhold Obamacare subsidies from insurers, cancel the Iran deal, force a shutdown over border-wall funding, and lift sanctions on Russia had all come to nothing. Of course, from day one, the president has charted a cruel, illiberal, mindlessly destructive course on immigration and environmental policy. But cruelty toward the undocumented and blithe indifference to climate change don’t place Trump outside of Beltway norms. Where the mogul’s “populism” has put him in tension with his party’s military and business Establishments, Trump has (almost) always demurred to “the swamp.” And after those Establishments finally pushed Steve Bannon out of the White House — and more troops into Afghanistan — there was reason to think that Trump would remain deferential to them, in perpetuity. But then, on Friday, Trump made the transgender ban official; pardoned a proto-fascist sheriff in defiance of Justice Department guidelines; and, reportedly, decided that he will buck popular opinion, and subject undocumented people who were brought to the United States as children to the threat of immediate deportation. Meanwhile, the president is apparently pressuring intelligence officials to manufacture evidence that Iran is violating the terms of the nuclear agreement. In July, Trump told The Wall Street Journal that if it were up to him, he would have declared Iran “noncompliant 180 days ago” (despite the fact that American and European intelligence officials agree that there is no evidence to support that claim). While the American foreign-policy Establishment was divided on the merits of entering the deal, no mainstream analysts support withdrawing from it unilaterally, on a false pretense. This is because such a move would do more to hurt America’s relationship with its European allies, and broader diplomatic credibility, than to discipline Tehran. What’s more, on Sunday night, Axios reported that Trump was considering firing one of the administration’s most reliable dispensers of such inconvenient geopolitical facts – Rex Tillerson. Among Trump’s complaints with the secretary: “Tillerson contradicted the president’s response to the recent tensions over Qatar.” In other words: The president may fire his top diplomat for refusing to allow him to poison diplomatic relations with a key U.S. ally (that hosts one of America’s most strategically vital air bases in the Middle East) on a whim. Rumors of a “Rexit” aren’t new. But they put Tillerson’s comments to Chris Wallace in a new light: Perhaps the secretary didn’t rebuke Trump out of confidence in his independence from the president, but rather out of indifference to remaining in a post where he must do the mogul’s bidding. None of these developments directly threatens the interests of Wall Street or the military-industrial complex. And the Arpaio pardon actually represents an instance of Trump honoring the advice of his aides, albeit that of his most radical ones. But they all serve as reminders that Trump doesn’t just play the president on TV — for all his Cabinet’s assurances to the contrary, at the end of the day, it’s the billionaire’s finger on the button. The scene: The Oval Office, during Gen. Kelly’s first week as Chief of Staff. Kelly convened a meeting to discuss the administration’s plans to investigate China for stealing American intellectual property and technology. Kelly stood beside Trump, behind the Resolute desk. 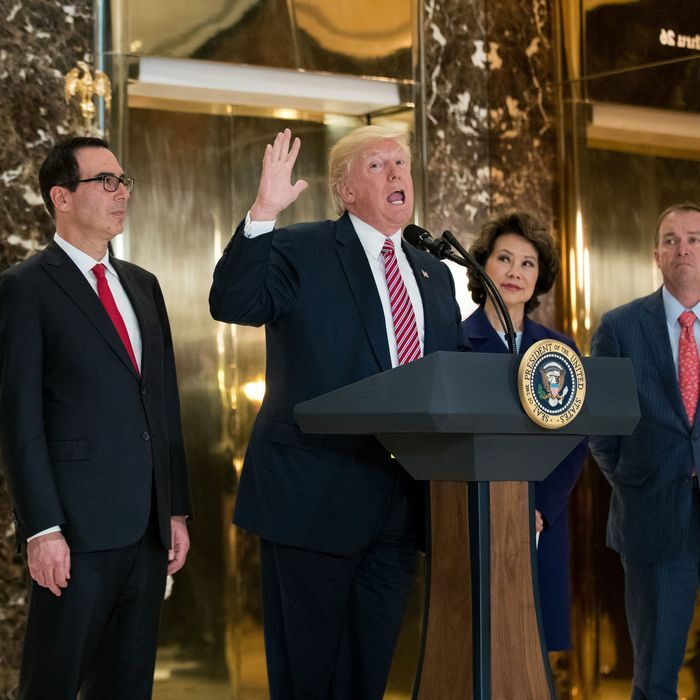 In front of the desk were U.S. Trade Representative Robert Lighthizer, senior trade adviser Peter Navarro, top economic adviser Gary Cohn, and Trump’s former chief strategist Steve Bannon. There are two ways to read this. One is as a toothless, symbolic gesture to Trump’s base. Axios is well-sourced among the (freshly evicted) Bannonites. This anecdote helps establish Breitbart’s new narrative — that the populist president’s better instincts are being stymied by “globalists.” And Trump has evinced some approval for this sort of story. In recent days, the president has indicated that he believes he can turn his policy-making impotence into a strength. The idea being: By claiming that his first-term was sabotaged by Establishment forces within the congressional GOP and deep state, Trump could still play the voice of popular frustration with the status quo in 2020, and campaign for reelection as an outsider within his own White House. Thus, the administration confirmed the veracity of Axios’s story because they want to portray the president as committed to his trade agenda — but helpless to enact it. Alternatively, one could accept the exchange on its face: Trump is anxious to start a trade war with China, and furious with those who keep telling him he can’t. If the latter is true, there’s reason for Wall Street to fear that, someday, Trump won’t take no for an answer. As his legislative agenda has stalled, the president has made a regular habit of publicly rebuking his party’s leadership. In most cases, these attacks have been rhetorical. But Trump’s decision to back a primary challenge against Jeff Flake represents a real, substantive break with the Senate GOP. Should tax reform fail, Trump could grow bolder. Already convinced that he needs distance from his party’s Establishment, the president may see little downside in bucking its wisdom on economics. Many of Trump’s most radical actions have been motivated by a desire to compensate for a legislative failure with executive action. The president’s decision to withdraw from the Paris climate agreement came as Obamacare repeal was falling months behind schedule. His pardon of Sheriff Joe Arpaio — and reported readiness to end DACA — came as his request for border-wall funding remains stalled in the Senate. The president can impose tariffs unilaterally. If his “jobs” agenda isn’t moving through Congress, he just might reach for that lever — and teach the business class what the most vulnerable people in America learned long ago: This presidency bites.